Well, we finally did it. We overcame our prejudice against (cringe) "running" bamboo and planted ourselves some. Turns out, we live in bamboo growing heaven. This country is slowly waking up to something the rest of the world has know for centuries: Bamboo is a truly magical plant. What's the magic? Oh, only the potential to save our sorry behinds from deforestation, soil erosion and scarce, expensive building supplies. More on what makes bamboo so wonderful later. For now, let me update you on our beginning bamboo grove. This picture is the one of the "moso" bamboo plants (a giant timber bamboo) we planted down by the barn last spring. 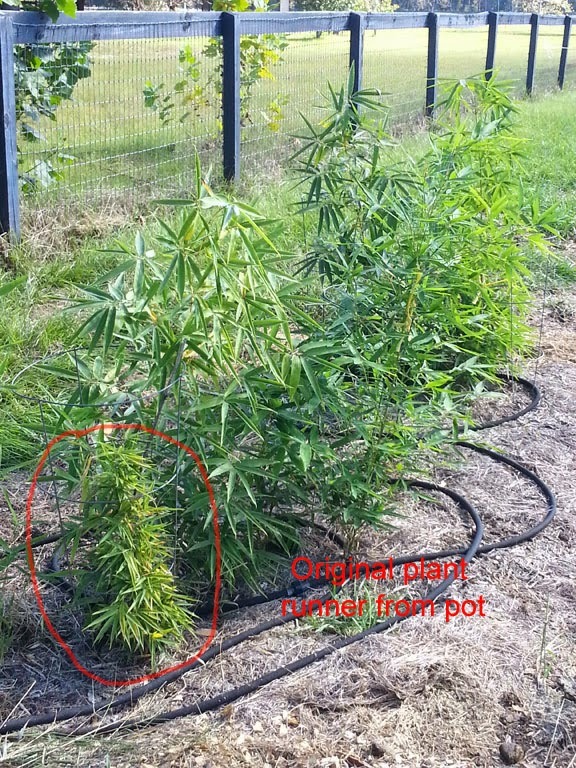 The original potted plant is circled in red. The remainder of those bamboo canes came up over the summer. A good friend brought us the moso bamboo culms from North Carolina late in the summer the year before. We planted the bamboo into pots and held them over the winter on our sun porch. We planted these potted bamboos early last spring, one by the barn and three in another pasture. The one pictured above developed a long root in the pot. So we stretched it out down the fence. These culms came up from that root pretty quickly. We prepared the planting hole and out away from the hole and down a trench for the long root by mixing several cups of Pure Black Castings™ and watered it in with VermaPlex® mixed 20:1. A foliar spray of VermaPlex® was applied throughout the summer as well as alternating drenches of VermaPlex® and VermaMax LE® (a higher nitrogen and calcium liquid available soon). Here's a link to our Bamboo R & D (Research and Development) page describing the applications and results. Throughout last summer, Kayce dumped all the manure and wet shavings from the horse stalls and paddocks around the bamboo and out, following the area where we wanted the bamboo to grow. We read (or Ol' Bill read 'cause I don't) that bamboo roots will grow towards the nutrition and moisture. We mulched the manure with old hay and kept the whole thing moist throughout the year. Bamboo sends up new culms in the spring-summer. After the culms come up, all the action is going on out of sight below the surface. Over winter, the root system is doing it's thing. . Because of the winter root growing aspect, we did a final VermaPlex® drench application in the fall to benefit winter root production. Then, this spring, the shoots started emerging. It was a little scary. Check back later for current pictures, if you dare. Pure Black Castings™: Certified Organic, OMRI listed worm castings. Slow release fertilizer for bamboo. VermPlex®: Certified Organic liquid soil inoculant made from these worm castings. Foliar feed for instant nutrition, drench for root growth and health. Together, they take care of your soil. 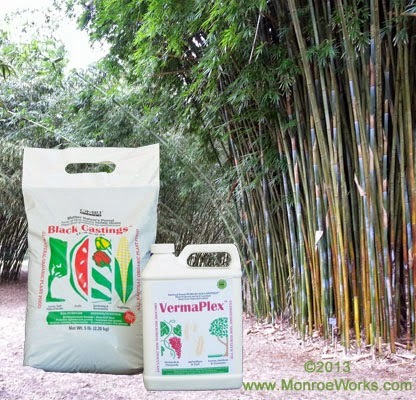 Click for more information on these organic bamboo fertilizers.